Read the report as 10 young riders head to the Brecon Beacons for a weekend of cycling some epic Welsh hills. The recent BCDS training camp test event has been a great success. Late September saw 5 x U16, 5 x U14 riders and 5 adult volunteers take to the Brecon Beacons for two days of hard riding. Organised by a number of parents the weekend was primarily for youth riders who had been regularly racing during 2018. The idea was to encourage a team spirit/approach to racing in 2019 and also to see whether if successful, it could be run again. Everyone arrived at the fantastic Brecon Beacons YHA near Talybont-on-Usk on Friday evening excited about the two days of riding to come. Some were a little nervous when hearing they would be climbing over 4,000 feet each day and following the last training route used by a certain Mr Thomas before heading off to Tour glory! The weather was beautiful on Saturday, chilly to start but warming throughout the day. The U16s showed their culinary skills by cooking scrambled eggs and bacon plus preparing large helpings of porridge/fruit for everyone. At the morning briefing, Hopcyn walked through the route and painted a lovely image of the day ahead. After 24 miles of brisk riding with the pace being set by our U16s, there was a welcome coffee stop at the renowned International Welsh Rarebit café, with the group dropping warmer layers in the support car which followed them all weekend. After the brief refuel the group were back on the road enjoying the great scenery and the Devil’s Elbow climb but perhaps the decent even more - one youth rider later said he loved "the spaciousness of the route”. More rolling climbs on the way back the YHA past reservoirs and open hillside where the order of the day, helped by a layby stop for restorative Welsh cakes (another G favourite!) as riders started to flag. After 5 hours in the saddle everyone rode into the YHA looking happy but tired. On Saturday evening the riders formed teams to take on the ‘epic’ BCDS Cycling Quiz Challenge, a tie breaker decided the U16s as narrow winners. On Sunday the weather was warmer but cloudier. Another breakfast cooked by the U16 was devoured with the U14s brought into action on washing up and drying. The team met to be briefed by Ian who was leading the second day’s ride. 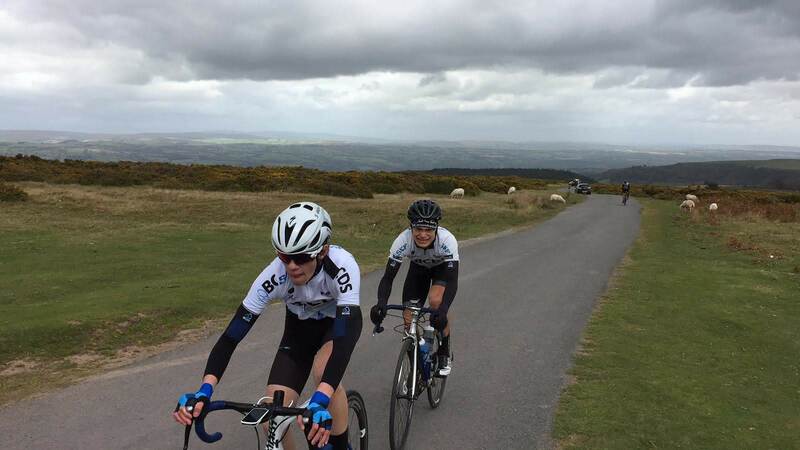 Today the group would have the opportunity to take on one of the famous Strava 100 climbs, Gospel Pass near Hay on Wye, a sustained 3 mile climb into a strong wind but rewarded with fantastic panoramic views. U14s, with brother Luca making it a family affair and taking the bragging rights for the U16s. Everyone was appreciative of the snacks and the chance to put on jackets at the top of the climb provided from the team car. After a technical but fun decent, jackets were again deposited with the team car as everyone warmed up once more. With well over a hundred often hilly miles now in the legs from two days of effort, all riders were happy to arrive back at the YHA. After showering, changing and packing up everyone came back together one last time. Rider’s spokesman Sam Kelly thanked the adult volunteers on behalf of the youth riders for what everyone agreed had been a great weekend. A big thank you needs to go to Gary Harris Cycles for loaning vital mechanical spares, Brecon Beacon YHA for being so accommodating and Hopcyn Matthews for guest leading and inspiring all our youth riders.